With the final rule expected soon, healthcare entities ready themselves for an expanded list of requirements. The buzz was palpable at this year’s HIMSS conference in Las Vegas, and it had nothing to do with any Hangover-style shenanigans. Instead, the commotion centered on the much-anticipated release of the notice of proposed rulemaking (NPRM) for stage 2 meaningful use. Overflowing crowds digested information and asked a plethora of questions as federal officials laid out the requirements. Between the February release of the NPRM and the May 7 deadline for comments, healthcare leaders formed an array of opinions on the hurdles they faced to meet the guidelines. Numerous healthcare constituents took the opportunity to respond to the proposed regulations, with the American Medical Association (AMA), 98 state and medical specialty societies, the College of Healthcare Information Management Executives (CHIME), and AHIMA among those chiming in. Now that the comment period has lapsed, many healthcare groups are urging the Centers for Medicare & Medicaid Services (CMS) to act quickly. In its comment letter, the Premier Health Alliance, which represents more than 2,600 hospitals, called on the CMS to publish the final rule no later than August to give EHR vendors and providers enough time to prepare for a 2014 start date. • More than 50% of all patients who are discharged from the inpatient or emergency department of an eligible hospital or critical access hospital must have their information available online within 36 hours of discharge. • More than 10% of all patients who are discharged from the inpatient or emergency department of an eligible hospital or critical access hospital should view, download, or transmit to a third party their information during the reporting period. “That’s frontier type of information, and there’s definitely going to be some reservations from some folks,” says Amit Trivedi, healthcare programs manager for ICSA Labs. Fauzia Khan, MD, FCAP, chief medical officer of DiagnosisOne, a provider of clinical decision-support solutions, says enabling patients to access their healthcare information electronically is problematic but “very much needed.” Still, there are significant barriers. For example, how do providers incentivize patients to be part of the paradigm? Khan suggests providers could selectively communicate with patients, offer financial incentives, or even use gaming techniques to encourage them to access electronic records. “But it’s certainly an area the medical community is not well prepared to handle right now,” she concedes. • How are we going to be measured on patient responses? • Getting patients to access the Internet to review their records is beyond our control. The increased focus on patient engagement is “going to be interesting in the sense that it’s going to require more automation if healthcare organizations didn’t implement this as part of their overall EMR package,” says Karen Knecht, RN, a partner at Encore Health Resources. “Things like having an electronic medication administration record in at least one unit, e-prescribing on discharge, as well as the online access to health information by the patients” will all provide challenges. Clinical quality care measures are among the core objectives hospitals must meet in stage 2. Under the proposed rule, they must satisfy 24 of 49 clinical quality measures. The qualifying data can be submitted through the Hospital Inpatient Quality Reporting System. 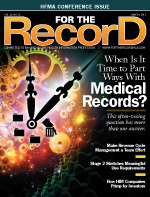 “It’s clear there is going to be this continued focus not only in getting data into the electronic health record but in the ability to aggregate, calculate, and record for quality measures as well as share and exchange information securely,” says Knecht, who adds that achieving the required number of quality measures is one of the most difficult aspects of meaningful use. In fact, a 2011 survey of chief information officers conducted by CHIME revealed that capturing and submitting data for quality measures was the biggest concern for meeting stage 1 requirements. That trepidation is only likely to grow with stage 2. Demonstrating quality is much more than capturing a data element on a computer screen, Knecht says. “Each of these measures has multiple components, including multiple data elements and associated code sets. It’s much more complicated than building an order set and building clinical documentation,” she says. Knecht recommends hospitals not focus solely on meeting minimum requirements but also look to the future. For example, Tenet Healthcare, an Encore client and one of the largest for-profit healthcare systems in the country with 50 hospitals in 11 states, recently had six hospitals attest to stage 1 meaningful use. “And this is an organization that had no electronic health record,” she says. In working with Tenet, Encore focused on building and designing around quality. “We had them thinking about how this data was going to be reported, not only for stage 2, but for all of the other kinds of healthcare changes on the horizon,” Knecht says. There is a sense of urgency about meeting the requirements, Wise says. “Stage 2 will quickly be upon us and a lot of hospitals still have to move through stage 1, so you take all these regulatory changes, along with what may or may not be happening with ICD-10, and you have to feel for these physicians and hospitals,” she says. For those providers still trying to make sense of the proposed stage 2 requirements, Knighton advises them to take matters into their own hands—literally—by reading the entire document, which numbers several hundred pages. For those with neither the time nor inclination to digest all that material, there are shortcuts available. • When do you anticipate entering the testing and certification process? • What’s the timeline for finishing the process? • Once the process is finished, when do you expect to roll out the certified system? • When it’s rolled out, how much will it cost? For hospitals that have yet to implement an EHR, stage 2 can provide the impetus to push them into an electronic environment. While stage 1 focused primarily on HIT adoption, stage 2 addresses more complex uses of technology, Trivedi says, adding that the issue isn’t whether an organization needs an EHR but rather understanding that it’s actually a cost of doing business.